Whilst a tent in the wilds is my favourite form of accommodation on outdoor trips that’s not to say that I don’t appreciate the comforts of a hotel now and again. Indeed I usually have a few nights in hotels or B&Bs during long walks as these give the opportunity to dry and sort gear, communicate with the outside world, eat something other than dried food and, hopefully, drink some decent beer. Mostly though when I stay in hotels or B&Bs it’s when I’m attending trade shows, mountain festivals or other events. Usually there’s little time to actually spend in the hotel which is just somewhere to sleep and have breakfast. Recently though I was offered the opportunity to have a couple of nights with my partner Denise in the Atholl Arms in Dunkeld in order to write about the hotel and the outdoor opportunities in the area. There were no strings attached other than that I’d write about the trip and it would allow more time to relax in the hotel and enjoy being there. 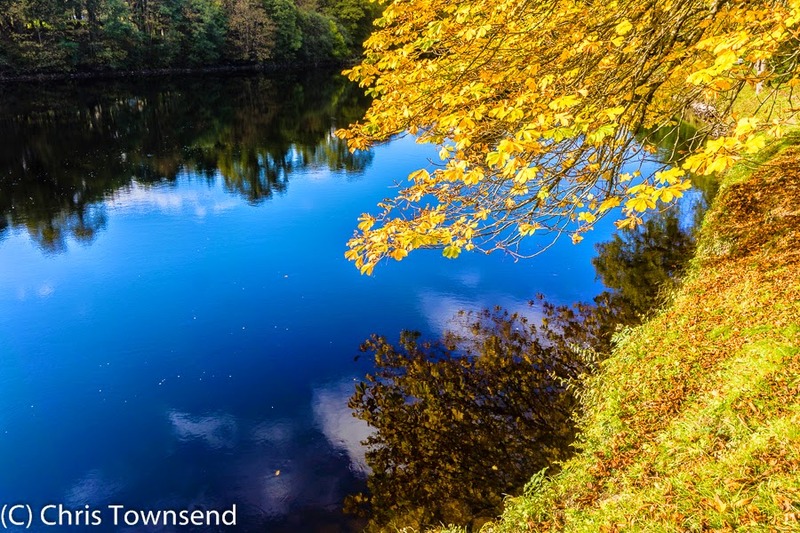 Dunkeld is in the heart of Perthshire’s Big Tree Country and whilst the area is lovely year round October is a particularly good time to visit due to the autumn colours. 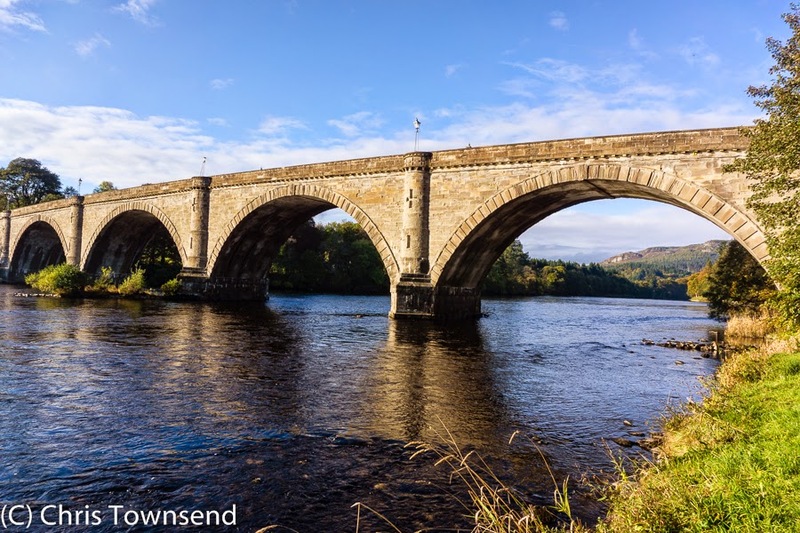 The Atholl Arms is a big old hotel, built in 1833, situated right by the River Tay and the magnificent Dunkeld Bridge, designed by Thomas Telford in 1808. We were privileged to stay in the huge Victoria Suite, which has a marble fireplace and impressive ceiling mouldings. I think this is the biggest hotel room I’ve ever stayed in – the only one I can think of that compares in size was in the very modern Little America Hotel in Salt Lake City in Utah, where I stayed many years ago when attending a big outdoor trade show there. The Victoria Suite was very comfortable and even provided some exercise it was so far from one side to the other! Of course the other rooms – there are seventeen in total – aren’t as big but are, hopefully, as comfortable. The Atholl Arms has a restaurant – the Riverview – and a bar – the Inn@Atholl. We ate in the restaurant both evenings and the food was excellent. I’m vegetarian and my partner is vegan and there were suitable dishes for both of us. The menu isn’t large but the quality is high. I also had a good pint of beer in the bar – a real ale called Head East from the local StrathBraan Brewery. There were two other real ales on tap that I didn’t try. Overall as a place to eat and drink the Atholl Arms is fine. Whilst in Dunkeld we also had lunch and snacks in various cafes and enjoyed them all. 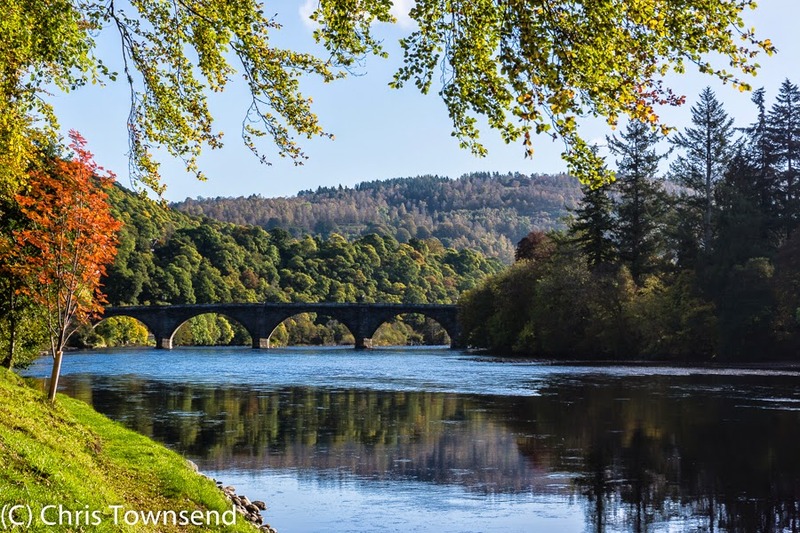 The real glory of Dunkeld is in the situation though, in the midst of glorious wooded hills beside the River Tay. There are big hills not far away, most notably Schiehallion, but on this occasion I wanted to see what the walking was like in the immediate environs of the town. The first morning dawned overcast but dry and we set out through the woods to the Loch of theLowes, a Scottish Wildlife Trust reserve. The walk to the loch and back on roads, tracks and footpaths through mixed woodland was pleasant and the loch itself splendid. 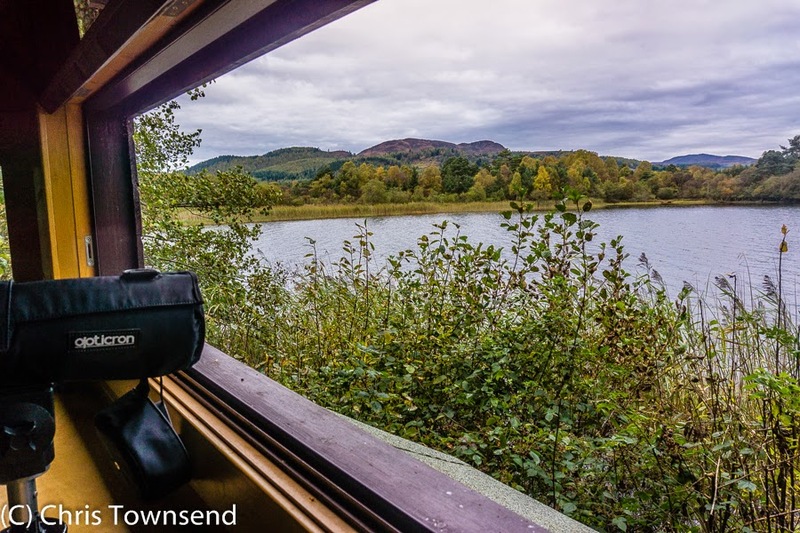 The ospreys that nest here in spring and summer were long gone but we were able to watch big flocks of goldeneye ducks, a Canada goose and a pair of great-crested grebes from the SWT’s observation hides. 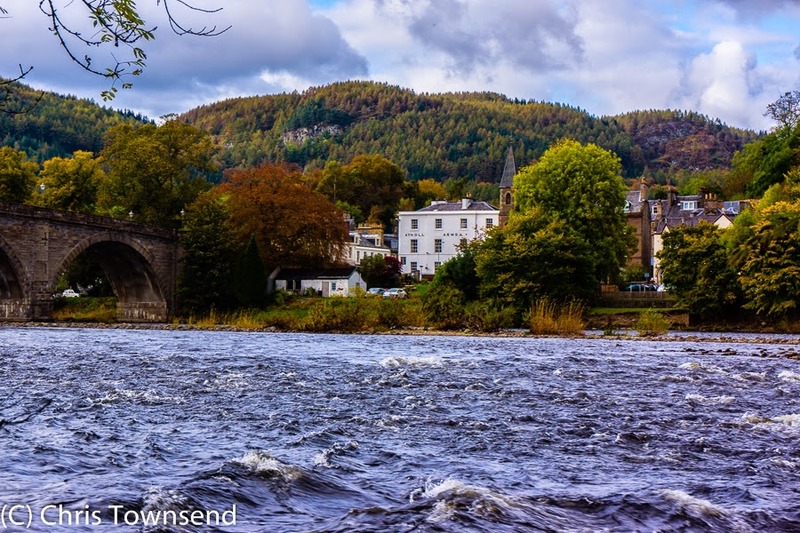 In the afternoon while Denise explored Dunkeld I set off up Birnam Hill, which lies across the river opposite the town. 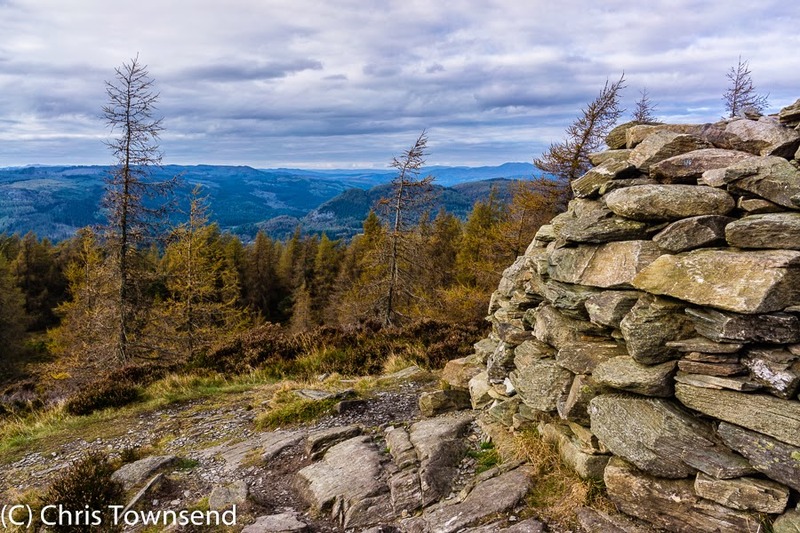 Although only 365 metres high Birnam is a rugged, craggy little hill and the hike over it feels like a real hill walk even though most is in in woodland. The mix of trees on the ascent is delightful with some big Douglas firs low down and colourful larch around the summit. Birnam Hill lies right on the edge of the Highlands. Looking south and east the land falls away to the Lowlands, a view seen well from Stair Bridge on the southern slopes of the hill. From the huge summit cairn you can look north and west to bigger hills, with Schiehallion prominent behind a long string of wind turbines. 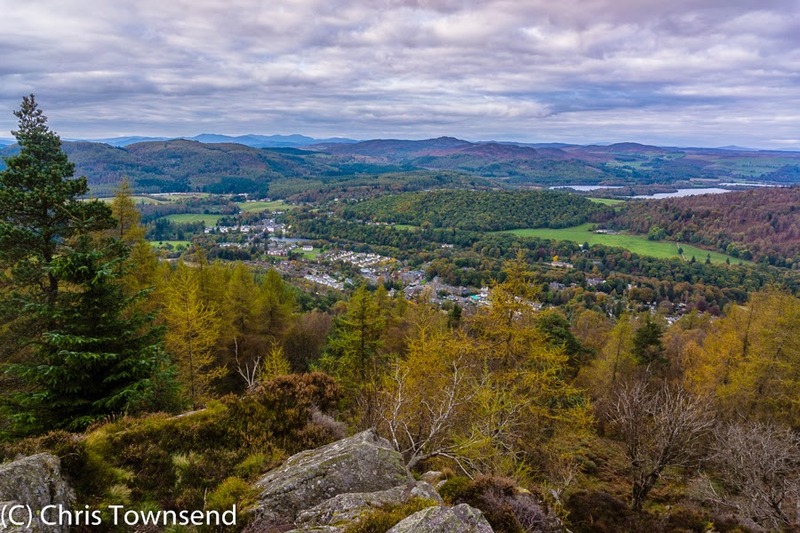 I descended via the steep north slopes of the hill, pausing at a rocky outcrop for an excellent view over the Tay to Birnam and Dunkeld and Loch of the Lowes. Sunshine made the trees glow the next morning and we delighted in the vivid colours as we ambled along the river bank to DunkeldCathedral, now half-ruin, half parish church. The larger roofless part of the cathedral was undergoing safety work so we could only peer inside. We were able to go inside the square tower, which has an impressive vaulted ceiling. In the non-ruined section there is an interesting museum and display with much about the area as well as the cathedral. There’s also the tomb of the Alexander Stewart, the Wolf of Badenoch, notorious for burning down the towns of Forres and Elgin in 1390. This is a magnificent edifice with Stewart carved as a knight in full armour. 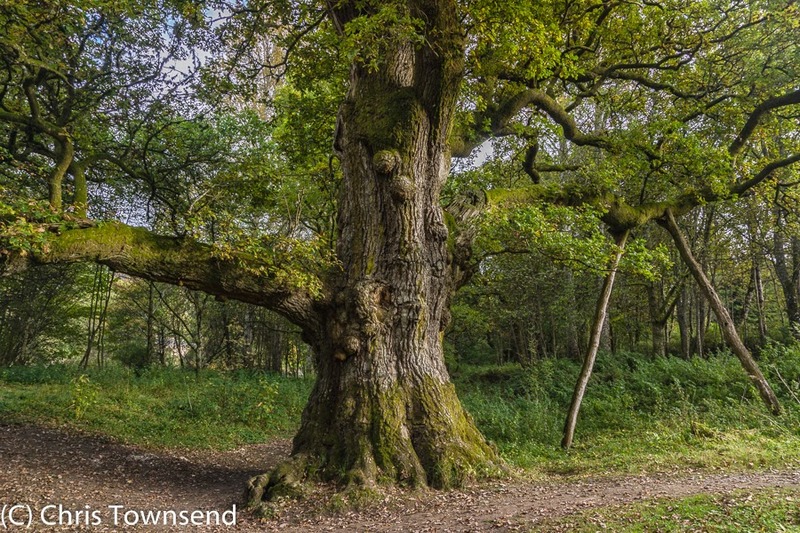 Denise having caught the train north to Aviemore (Dunkeld and Birnam Railway Station lies on the Perth to Inverness line, making Dunkeld easily accessible by train) I had one last walk beside the river as I wanted to see the famous Birnam Oak, a gigantic tree with massive boughs supported by props that is reckoned to be the last survivor of the Birnam Wood in Shakespeare’s Macbeth (though probably not from the time of Macbeth himself). There are other fine big trees in the wood here, their old gnarled appearance reminding me of the Ents in Tolkien’s Lord of the Rings (annoyed and disappointed by Shakespeare not really having a wood move, which he thought a marvellous idea, Tolkien has the Huorns of Fangorn Forest coming to the relief of Helm’s Deep) though it was hard to imagine them going anywhere. The visit over I headed back north to Strathspey. The softer landscape around Dunkeld had been a pleasant change from the Cairngorms and one to which I will return. Short menus are usually the best. On the Spanish Camino the choice was often very basic: meat or fish. That was it. Well, with pilgrim soup first and flan (crème caramel) after.